The picture says it all~! Wishing TianChad the BEST of LUCK, WEALTH, HEALTH and HAPPINESS. 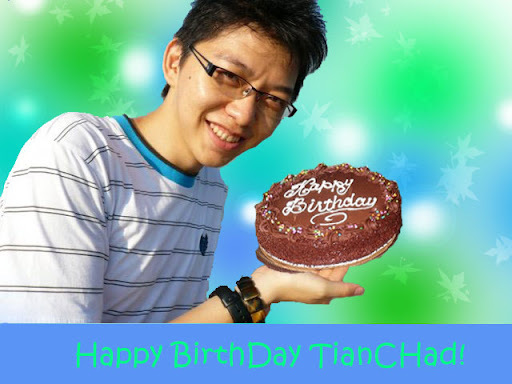 To all my friends, you can view TianChad's Blog here. Today will be the last day of 2009. Today will also be my last day of writing about the Couple Nightmare in my house (refer previous post here). 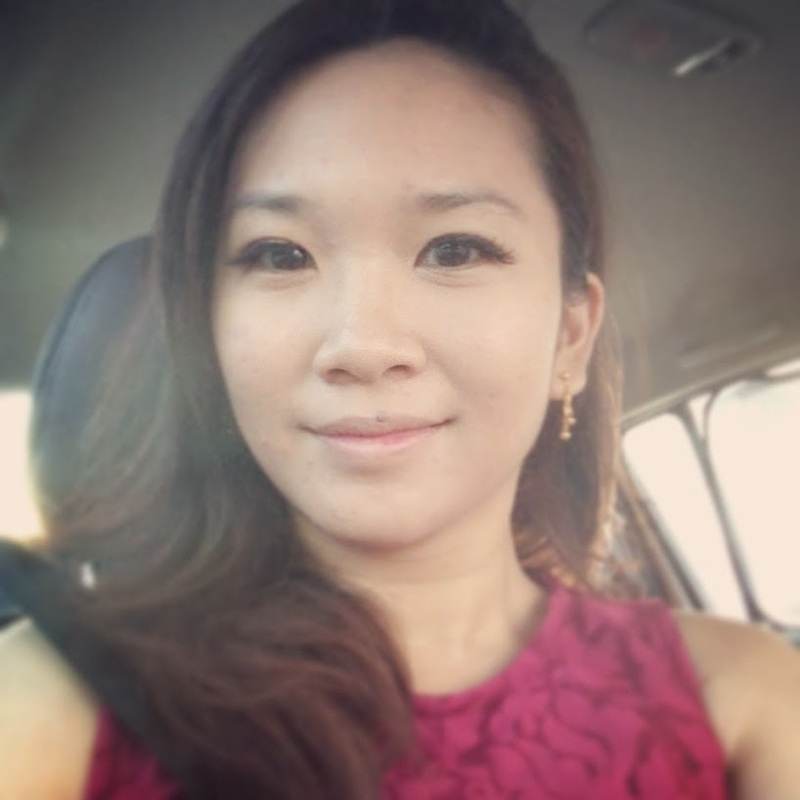 It all began in March, when a friend informed Wern that her friend needs a place to stay. I asked Wern, "Your friend ok or not?". She told me she dont know that girl but since her friend introduced, it should be ok. When the girl came to my house, she was all friendly, nice. She says she needs a gas and a fridge because she will be cooking. I agreed, since i myself need to cook at times. So i bought a refrigerator and kept my word. She told me that her previous housemates are indians, and they stole her things, walk with underwear on in the house, and this make her unconfortable. The owner refuse to return her deposit as well! At that time, deep down, i have thought that this must be a problematic person, otherwise, why did the owner refuse to return the deposits? On the 1st week of her stay, i talked to her and treated her nice. Then we had dinner together. She began cooking and cooked for me to eat. I thought i found a housemate from heaven. Never i knew that this is the beginning of the horrific nightmare. Just after 3 dinners together, suddenly one day they started to fight. I thought it was just a normal argument, so i closed an eye and didnt want to interfere. Whole house were awaken by the noise, and what we heard was the girl yelling hysterically, and the guy asked her to calm down. Then suddenly she came out and went to the store to take a huge, big, bundle of wires. The bundle is as huge as my arm... Then we heard whacking sounds. I was worried so i yelled over the window. I said, "stop it la". They ignored me and continue fighting. 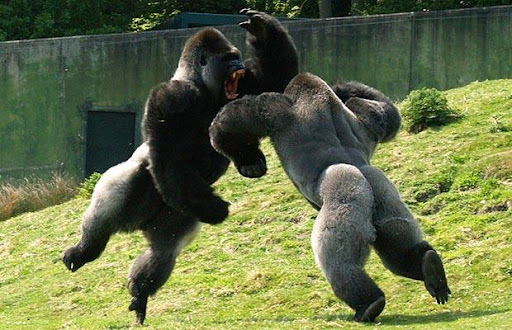 From then onwards, the fights became more and more frequent. I wanted to kick them out, but Wern told me it's just a few more months that we will be shifting. She didnt want to go through all the hassle to search for another housemates. So i tollerated. Their fights are usually caused my simple things: Didn't pick up phone, no money, Come back from work late until the soup turns cold, reverse until his motorcycle fell, the car parked crookedly. There's a lot of fights that i dont know about, because im seldom at home. They started fighting in their rooms, which is still tolerable, then they can fight in the hall, to the kitchen, and even outside they can shout like nobody business. There's also weapons involved: Scissors, knives, hanger, bundle of steel etc. If you go to my kitchen, you can see that she has a full set of knives, ranging from the smallest to the biggest. She also have the grill cutter kept in the storeroom, and the steel bar (used to break glass windows) in her car. Another thing that i HATE about her is, she complains A LOT. Some of the complains that i have endured during the past 9 months:- Tell Loy (another housemate) to keep his toothbrush away, tell Loy not to put his pail in toilet, the air-cond is too old, No this, No that, water leaking that she must sleep in the living room. Most of her complains are to inform me that i MUST tell the other person not to do this and not to do that! Then in front of the other persons she so sweet and nice. Which of course i didnt inform the other person. Last night, i stepped into the house, then she yelled at me (like she yell to her bf). She said "EH, your aircond leaked water!!!" I looked at her calmly, and said "oh ok". As i turned to go upstairs she say again. This time her voice is softer (like talking to other people). "The water gushing out like that you dont want to repair?" she asked me. I looked at her and say " What you expect me to do at late night? I dont know how to repair the air cond." Then she told me, "Tell you so that you can tell the next tenant ma". I just nodded and walk away. My evil heart tells me maybe she cut the pipe until water gushes down). I didnt want to drag further conversation. Leave, just leave. When i asked her to shift by February, she told Wern that she will shift by tomorrow (which is yesterday). So, she asked Wern " Where my deposit?". Havent move out already request for deposit! Havent return me keys already she wants her deposit! 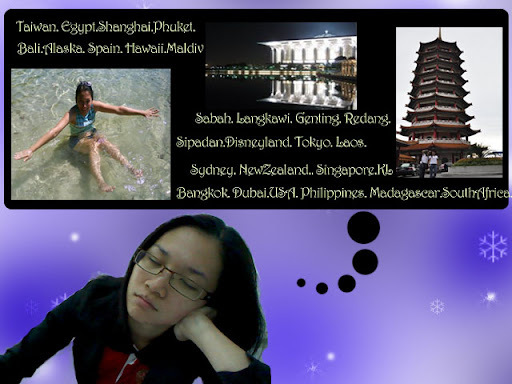 Today is already 31st, a day after she said she will shift, she is still sleeping in my house while im writing this. Me and Wern already bought a medium size New Zealand Natural IceCream to celebrate! Yahooo! Not celebrating the New Year! but celebrating the departure of the CrazyCouple! God Bless.. Happy New Year folks! It was the usual, silent nights that we normally had. Once a while, the couple downstairs will break into a HUGE fight for no reason. Living in KL, i knew that i had no choice. This is not my HOME, and sharing a place to live means we have to tollerate. I understand that couple fights. 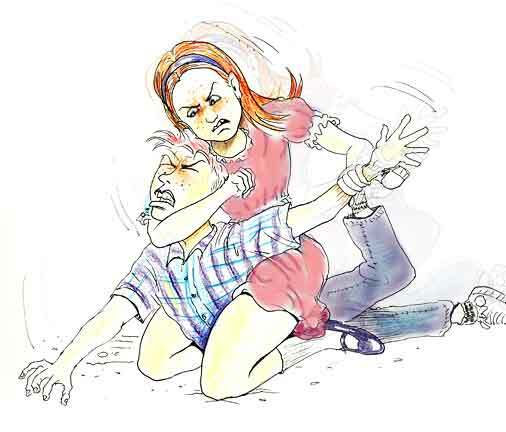 Fights and arguments are signs of positive relationship-Provided that the fights and arguments, is a healthy one. I have been with XeRoZ for more than 4 yrs. We fight, i whack him (gently), he whacks me (almost never). But we never hurt each other more than that. We fight and argue to achieve an agreement-to make a decision. And when the fightings and arguments is done too frequent, we both evolve to the stage called "DISCUSSION". Discussion uses less energy level and more user friendly. THIS is how it should be done. As for my housemates, i have been living with them since March 2009. In April, they broke a fight, i deeply regretted for letting them stay. In Feb, she told me that she was being bullied by her Indians housemates and would like me to rent the room to them. I pitied her and took her in. Only to realise that she will be living with her boyfriend. I told her i had BAD experience living with couples. (My ex-housemates in Setapak Indah, she will bang the wall and slash her wrist for no reason). She promised me that they argue, but not fight. And that was an OUTRIGHT LIE! Since March 2009, my house was never as happy before. I wrote before that i felt depressed. I occassionally run to Ampang for shelter. Otherwise i keep myself busy at night so that home will be a place for me to sleep. We can never keep running... I chose to fight them yesterday. I rushed downstairs, slammed the door, and yell at the top of my voice. Anger kept flooding me, and my knees were shaking uncontrollably! I shouted angrily " HEY ENOUGH, I HAD ENOUGH OF U BOTH! YOU KEPT FIGHTING LIKE NOBODY BUSINESS! NOISY LIKE HELL! NEXT MONTH U BETTER SHIFT OUT! I DONT WANT TO STAY WITH YOU ALL ANYMORE"
Both Wern and my other housemate stared at me. Thinking that the fight stopped. WE WERE WRONG! They continued fighting. Whacking each other.. I shouted again! " IM GONNA CALL THE POLICE. DONT U DARE ME!" Then i turned to Wern and asked her to call the police. She did. Shin Yi yelled back "Call the police, tell the police he hit me" I ignored her. I sat downstairs for 10mins till the police arrived. I felt relieved. The 2 policement knocked on their door, they opened it. and the policemen did their job of questioning and talking to the guy. The weird thing is, the girl pretended she was a VICTIM. And the Ah Wai lied to the policemen that they just fight once only, it wont happen again. He took all the blame by himself. He said that he knocked himself and bled. (The policemen knew it was a lie). One of the policemen went into the room and found scissors, etc etc on the floor. He warned her, "i took his name and ic already, if anything happens to the guy, we will look for you because YOU ARE THE MURDERER". The police left, and Ah Wai told me sorry. I took the opportunity to tell him to shift by Feb. In 20mins time, they continue ARGUING, and a car came to pick them up. They then, went out together. Many of you will ask, what is the issue that the fight broke out? DID the guy owe some one money? DID any one of them had affair outside? What you think caused the fight to happen? Her car was parked too out, and Ah Wai went to re-parked her car. She feels that he parked too out as well, and commanded him to give her the keys. Then she parked, and she threw the keys to the ground. He picked it up. Then she told him, "You dont have to buy dinner for me, i dont want to eat". And this is how the fight happened. To all my buddies, sorry if i caused you all to worry so much yesterday. It was a shocking incident for me. I will write up more stories to tell you my ordeal for the past few months. I cant wait for them to shift out as soon as possible. I had the most unexpected, and exclusive invites to the 1st day release screening of Avatar. I was lucky that TM (Telekom Malaysia) had some event going on, and i was invited to the screening of Avatar on the 18th of December, 9.30pm at Midvalley. I looked so tired and fugly! YUCK! Thanks to Jack for the invites! From left to right: Jian aka XeRoZ, Jack, Raymond, Ray's gf, Koko and Fugly me. 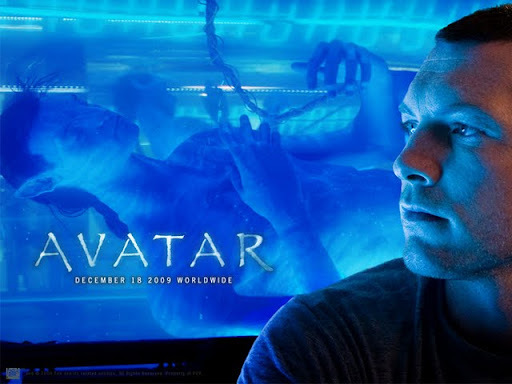 Before i went to watch this movie, i've heard loads of stuff about Avatar. 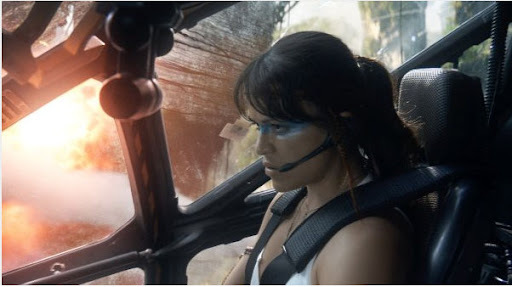 The so-called BEST MOVIE OF THE YEAR directed by James Cameron. When i saw the poster, the only thing that catches my attention is the ugly looking, blue coloured creature! 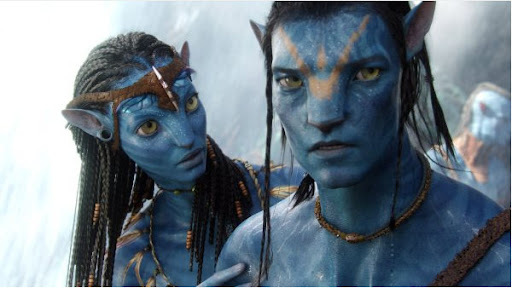 Deep in my heart, i say "No way i gonna watch Avatar. The creature looks so scary!" When i got the invites (free stuff are hard to resist! ), i had in my heart that this will be an OVERRATED movie. 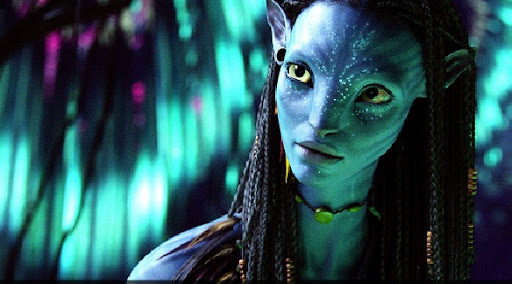 I wasnt disgusted at the BLUE HORRID LOOKING creatures called Na'Vi. Instead, it felt like being splashed with water on my face. We, humans, are GOOD LOOKING creatures but with EVIL heart, filled with greed and lust for power and wealth! 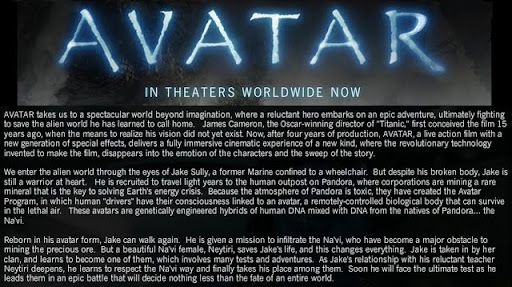 Avatar is a entirely science fiction movie. But the message is strong. I dont know whether it's me who felt it? Or it's a message for the entire world. I felt the urge to cry because the feeling is so real. We humans, not only destroy the Earth for our own selfishness, but also destroy places that is not ours. Forget about Pandora.. Forget about Blue coloured creatures. I hoped that everyone who watched this movie will gain some enlightenment on what's going on to our Earth. Earth is dying. We killed it. We are like the Na'Vis who knew that the destruction is coming and yet done nothing. At the end, all is lost.. There's no one that can rescue our Earth. There's no Toruk Macto that will lead us and fight against corruption, pollution, extinction and destruction. So, it depends on us to CHOOSE; which side you are in? The one who destroy? or the one who protects? I end my ramblings with a picture of the heroine i loved and wished to be.. 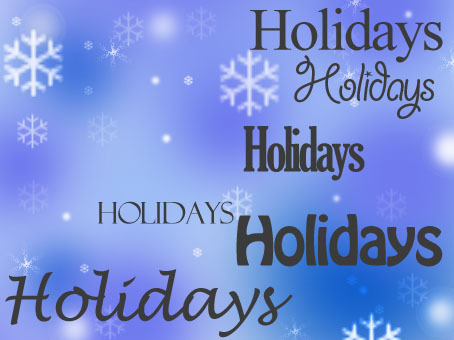 It's H.O.L.I.D.A.Y.S season! The BEST PERIOD of the entire year! 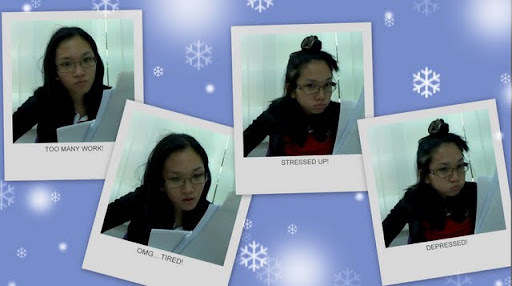 And unfortunately for me, i'm still enduring the stressful and hectic time at WORK! I'm not going to waste such wonderful holiday season working! It's time to go for a break!!! 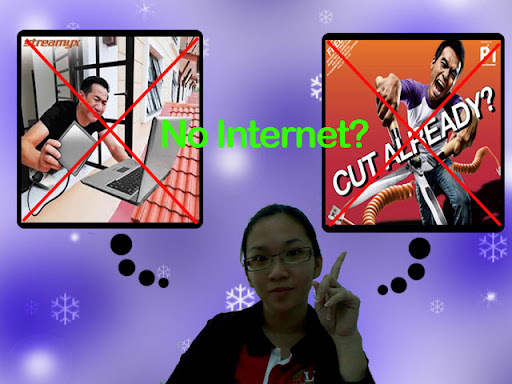 Being in the office, the internet access is limited. Employees are not allowed to surf the internet openly. *sigh*.. I dont have to worry about not having the internet! 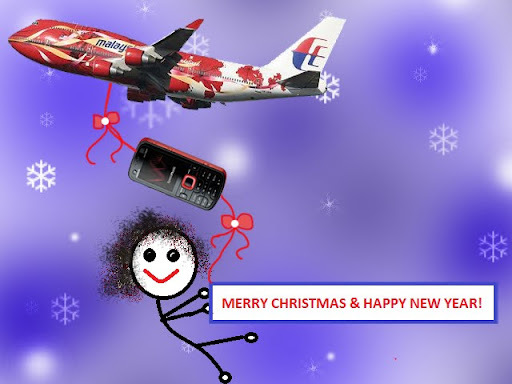 As long as my mobile is with me, i can access to the flymas.mobi mobile site, the door to my HOLIDAY LAND! 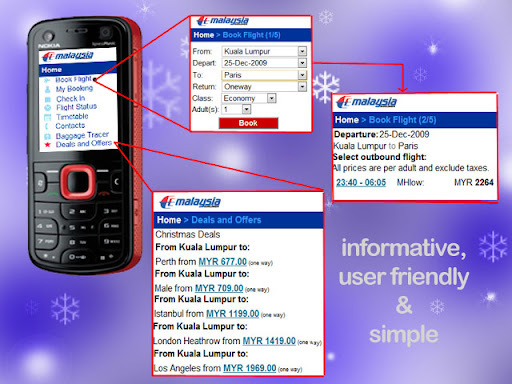 Flymas.mobi is informative, simple, loads fast and booking is now as EASY as 1,2,3! 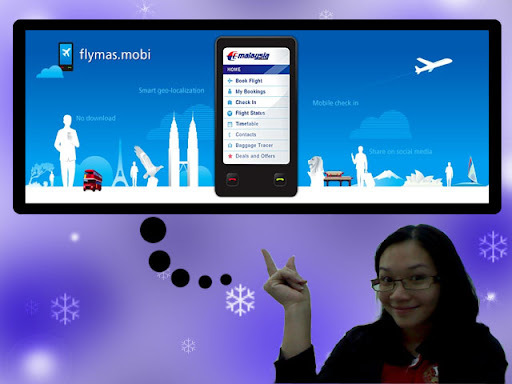 So, no matter where i am and where i wanna go for holidays...flymas.mobi is in my pocket with me! It's absolutely wonderful! Whether i'm walking the Pasar Malam, or trapped in the jam. 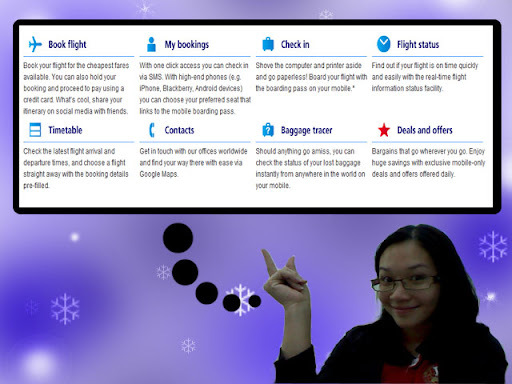 I can always check on my booking status, promotions and luggage status. 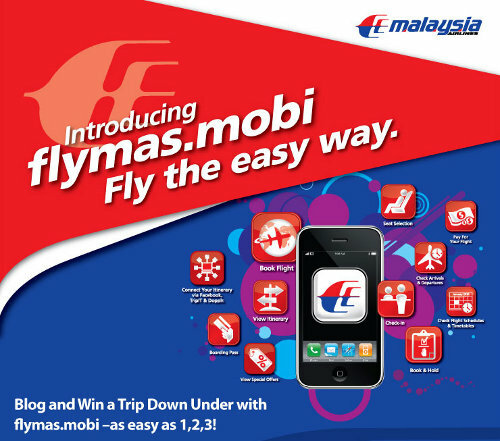 I can boast about flymas.mobi while having mamak too! Well, it's Christmas Eve and i'm praying that this christMAS, my christMAS wish will come true! Till then, take care and MERRY CHRISTMAS to you all. Love ya always! We began our journey at 11am on Friday. 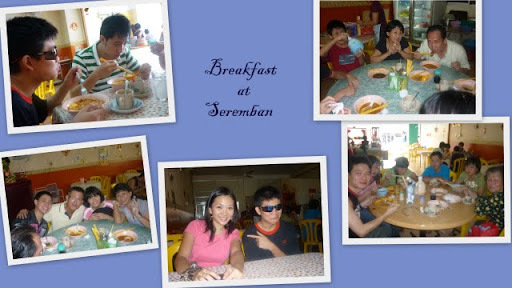 First stop is to fill our empty stomachs in Seremban. Then up we go to Melaka.. We arrived in Melaka happily and headed to Baba Charlie's Homemade Nyonya Kuih. It's located in a place where event satellite cannot detect. The street is so narrow and i wonder how come people can know of this place! It is a heaven for Baba and Nyonya kuihs! 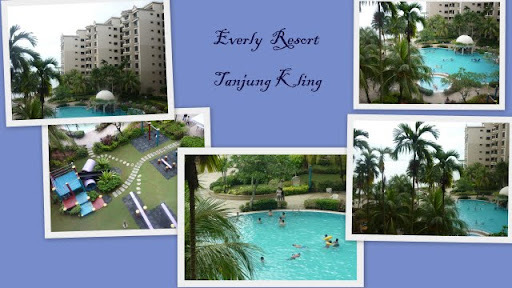 After that we checked in our hotel-The Everly Resort. It is located quite near my kampung house. Used to be called Riviera Bay. It is just beside the beach, but the beach is quite small. We rented an apartment with 2 rooms and 2 washrooms, big hall and complete kitchen. However, it's a bit dusty. I would say the price is quite expensive for 3day 2 nights trip. A whopping RM860.00 if not mistaken. 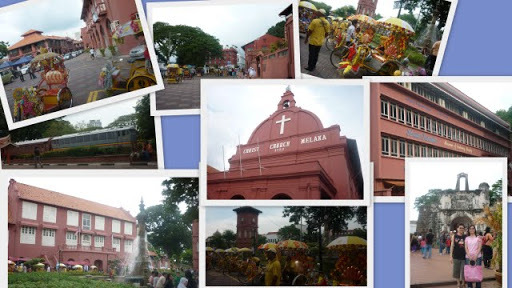 After arriving at Melaka, we went to town and visit the red house area-The Stadhuys. I used the new Limbongan highway right up to Pahlawan, and parked there. The sky was bright and sunny! A good start for a nice weekend! 1. Take Photographs of you and your family. 4. Guys can also come here to "da fei kei" or in English, it's call beat aeroplane. Look how euphoric are they! Suddenly, the gloomy clouds attacked our clear, blue sky. We had to run to find shelter and wait until the rain stops! Despite the heavy rain, we were determined to go to Jonker walk @ Jalan Hang Jebat for our dinner and sight seeing! We arrived at this Restaurant Jonker Street 88. You'll never miss this shop as there will be queue of people until the roadside. After dinner, me and Jian rushed to the car. Then, the rain stop abruptly. 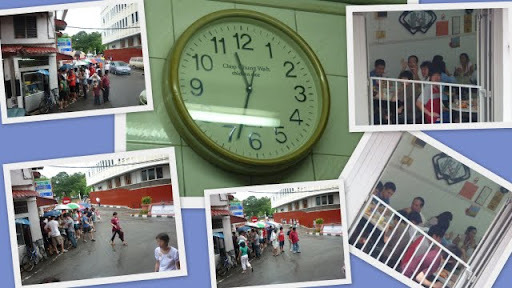 As for the rest, they went to Shum Shu Gong and enjoy the pastry and cendol. Look how much fun they have! 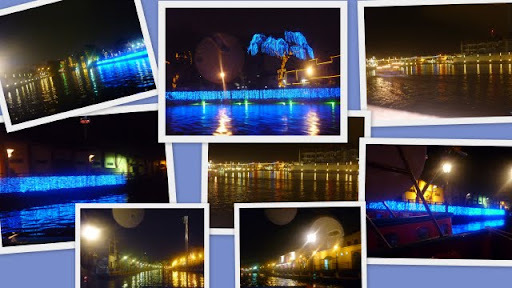 Once the rain has settled down, we went for Melaka River Cruise. It was a beautiful boatride. There's so many lights, it is almost like you are in Orchard Street, Singapore. 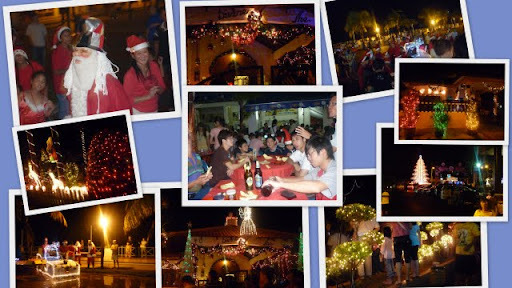 The good point is that you dont have to walk to see the lights..hehehe. The bad point is, it was raining so heavily that the boat service has to be halted. Thank God that we managed to ride on the boat after queuing for 30mins. Then we went for Satay Celup at Restaurant Ban Lee Siang at Jalan Ong Kim Wee. I was too excited seeing fishballs i forgotten to snap photos! 98.8fm crew who was also there came up and gave KahYee some goodies! Thanks 98.8fm. Keep it up bring happiness to your listeners! The rain seemed to be unstoppable! We had no choice but to return to the hotel. Everyone had a good nap. Once the weather permit, we went for dinner at Portuguese settlement at Ujong Pasir. One disadvantage of having a GPS is that, once the coordinates are wrong, we all landed all over Melaka. hahahahah.. Thank God we all managed to find the Portuguese Village. The Portuguese village is beautiful during Christmas Season! Then they went on to ride one Eye On Malaysia Melaka while we returned to the hotel to pangsai. hehehe..
On the final day, we went to Amy's Heritage house for lunch. When we arrived, we were all starving. 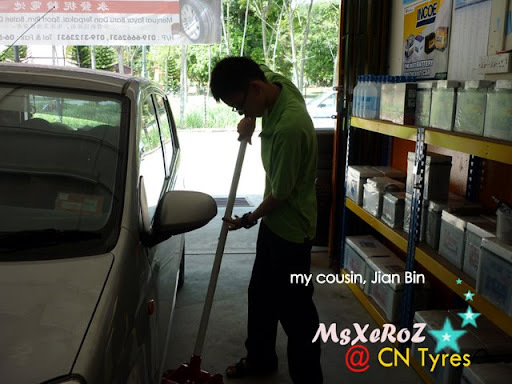 I was busy ordering the dishes, when i saw my 2nd aunty working there! HAHAHA.. such a small world! We ordered ikan lada hitam, ayam pongteh, bendi kukus and kari lemak nenas. I feel that the food is fused with authentic spices-Nyonya dishes, while other's think that they dont like it. I feel that the food is delicious, the sambal and kuah cili is very appetizing. Amy is also very friendly and gave us some parking coupons! Here i list down the places i went and also the price. Hope it helps if you gonna plan your future visit to Melaka, the town of History. 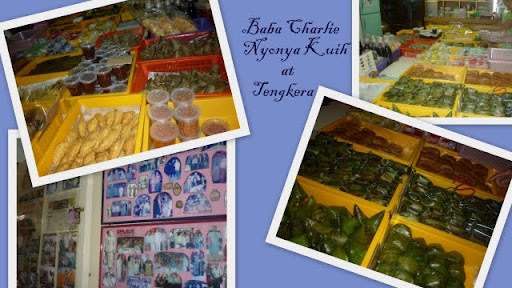 Baba Charlie Nyonya Kueh (Tengkera): price varies depending on your selection. 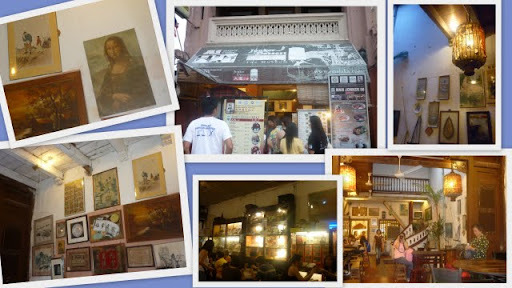 Jonker street: free (sightseeing), pay what you buy. Melaka River Cruise: RM10 (per person), for 30min ride approx. Ban Lee Siang Satay Celup: RM0.50 to RM0.60 per pcs. MERRY CHRISTMAS AND HAPPY HOLIDAYS~!! Santa, i wish i have presents this year! Last week, i have decided to drive down to Melaka to join in my Grandmother's Deathday Anniversary. So, i have to take my car for some minor checkup at the nearest car service center- Top Speed Car Care Eleven at Bandar Puteri Puchong. 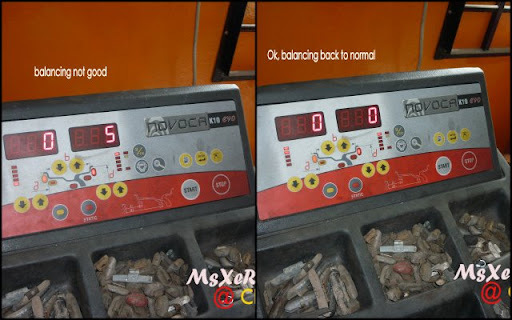 I know that servicing car is throat-cutting, but due to convenience sake, i left the my dearest car into their care. I told them to readjust my balancing and allignment. 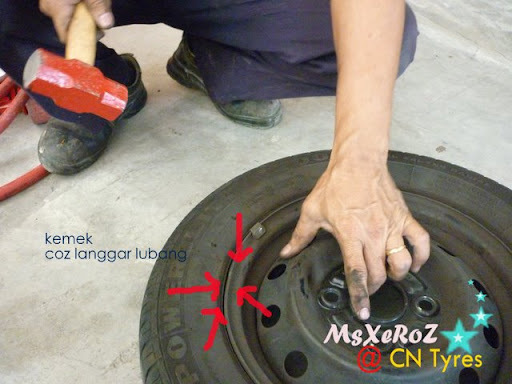 At 4pm, i went to the shop, and was told that my brakes are wearing (cost: RM75), my canter misallign (RM45) + balancing and allignment (RM42). I refused politely and demanded that they fix my balancing and alignment first. They told me the balancing and alignment is fixed. To my aghast! When i drove home, i noticed that the steering is "senget" to left but the car is moving to the right when i let go of the steering in a perfectly straight, even road! WTF! I paid RM42 for all this rubbish work? I wanted to U-turn and F*ck the fella upside down, but i had to rush to Melaka for appoinment early next morning. Being furious all the way to Melaka, i realised that the car is shaky, vibrating, and my heart is not a peace after being told that the brakes are wearing. I called up my uncle and Hey Hey.. 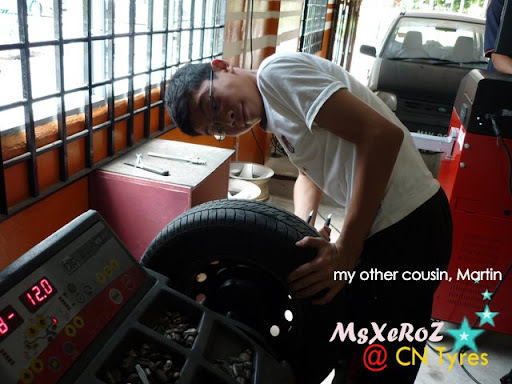 He just opened a tyre shop in Melaka! Here's what my uncle aka Mr. McGuyver did to check on my car. Since my cousins are there, they took turns to learn some basic stuff. 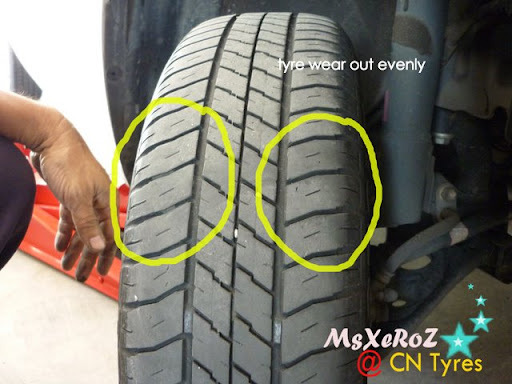 The tyres were removed and checked. Then, i received another shock! I now understand the significance of taking good care of a car. 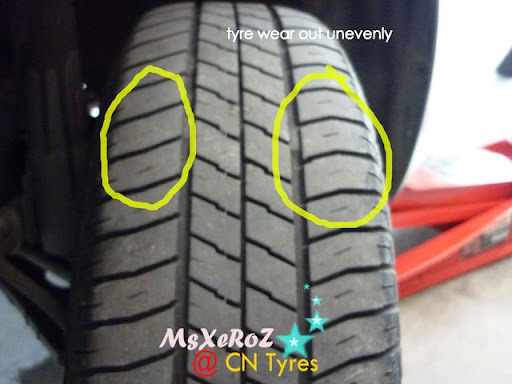 One side of my tyres are wearing unevenly. It means that im running under a mis-aligned vehicle. Then my cousin explained about balancing. Yeah, as i predicted. My balancing is out again. I doubt whether Top Speed did any adjustment for me? Or they just charge me blindly? 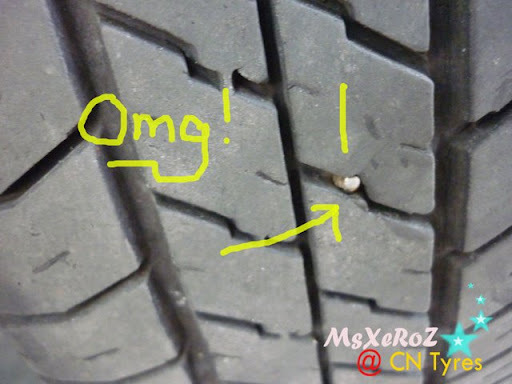 Another shock of the day: One of my rim (the same tyre with nail in it) is so crooked inside and outside. Top speed also didnt inform me about this. The rim is so crooked that if you remove the car for balancing you can easily notice it. This is another evidence that makes me doubt whether Top Speed did their job or not! 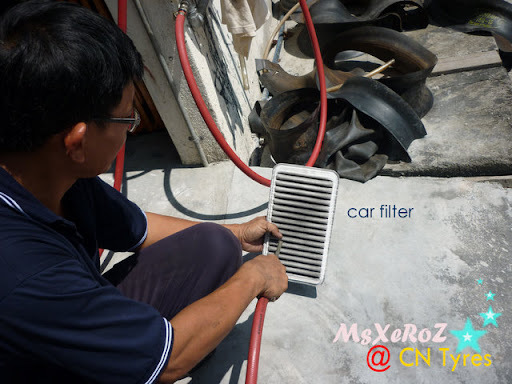 Then he clean the air filter for me. I think that my uncle did a great job. I'm very satisfied and happy. After being a car owner for 1yr and 6 mths, finally there's someone who teaches me how to take care of my car. So if you are having some car related problems in Melaka, do drop by at my Uncle's place. It's very easy to find (for Melaka people). From Simpang Ampat Toll, exit at the 4th traffic light. Drive down 2km approx. The row of shoplots are on your left. It's the end-most shop. If you are coming down from Alor Gajah, You will come with a three point roundabout. Head on to Jalan Dato' Naning. Move straight until u see the shoplots on your right! I promote this shop to the max, until that maybe some of you think i have share ya? 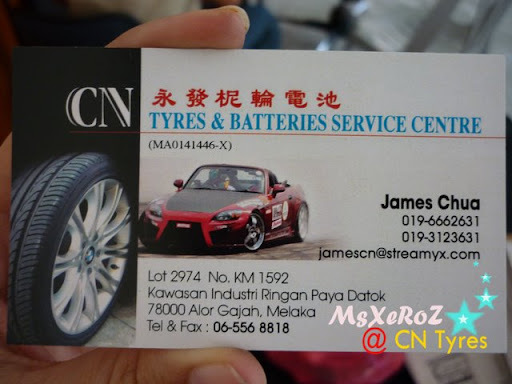 CN Tyres & Batteries Service Centre..
LOL. Joking lah.. This is NOT my shop. I am NOT paid for this advertising. I'm just helping my uncle in his 1st business. Sincerely, i think good things are to be shared. Especially if you have a car (ur biggest or 2nd biggest asset), i believe that everyone wants the best for the most reasonable price. Just mention my name: NICOLE, if u say MsXeRoZ i don't think he knows who is it. I'm sure he'll give u special price! You can call up to ask him the price if you scared it's too expensive. Nicole, You Are SO GROSS!